About 1927-1928. I bought this one because of the beautiful illustration. I made this up recently in a print fabric, so I didn't use the transfer for the embroidery on the collar and pocket bands. If I'd been thinking about it, I might have done the collar, cuffs, and pocket bands in a solid color. Well, perhaps next time. 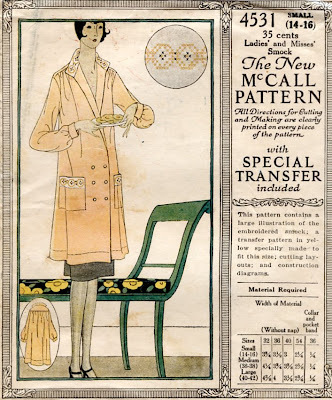 I can't speak highly enough of the drafting of McCall patterns of this period. The smock practically put itself together. The biggest puzzle was the button placement. The pattern piece didn't indicate where buttons or button holes should be placed. 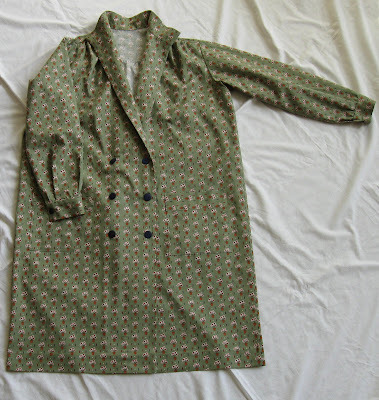 I looked at a somewhat later smock pattern and from that one discovered that only the buttons closer to the edge are functional; the others are decorative. I used the illustration as a guide for the buttons. The sharp eyed among you will notice that the pockets aren't level with one another. This is why it's probably best for me not to sew too late into the night. I had cut the pockets without regard for pattern matching and then discovered (after I'd sewn on the bands) that I had a little problem. I have no idea why I didn't just cut another pocket. Instead, I matched the pattern for each pocket and let symmetry fly out the window. It is, after all, a gardening smock and in a year or so should be grubby enough that nobody will notice. 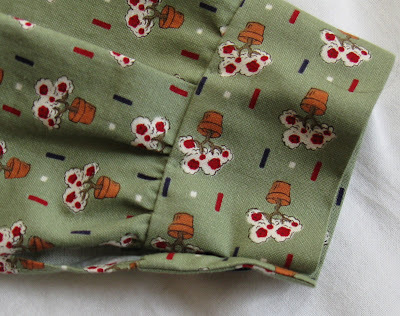 The fabric is by Windham Fabrics, from their Vintage Euro Garden line. The tray of cookies and her hairstyle did it for me. I must admit I like the back detailing more than the front. Love the fabric print! The cookies, the hair style, her shimmery stockings, and whatever that green painted piece of furniture with its flowered cushion is - it's just a great illustration. Great fabric choice! And yes, that's such an attractive envelope.